DYNATUNE has originally been developed around standard equations of a linear bicycle model, which are very well known in automotive engineering literature and do not need additional explaining here. 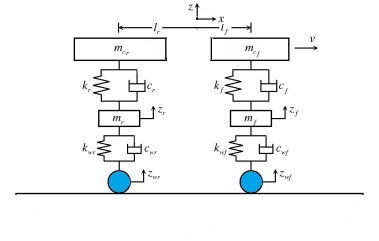 The capabilities of a bicycle model are demonstrated nowadays in every ESP system, where it is being used to estimate accurately even extreme vehicle conditions. The classic limitations of a bicycle model - being a mono-track model and not permitting calculation effects of vehicle roll - can be largely overcome by adding some additional detailed chassis calculations and including all elasto-kinematic suspension & tire characteristics into one resulting front and rear AXLE cornering stiffness (ref. BUNDORF). This approach permits the bicycle model to be used accurately to calculate understeer budget, step steer response, frequency response in various load conditions, even up to non-linear range type lateral g-load conditions. In order to calculate and analyze in detail any specific vehicle conditions DYNATUNE does also come with a sophisticated 7-DOF vehicle model that provides - in comparison to the Bicycle Model - additional results like roll & pitch data and all vehicle loads (quasi-static, no inertial effects, no damping) and suspension geometry data for the 4 corners of the car. The equations used in the 7-DOF model are the classical equations of motion, explained in many literature of vehicle dynamics and commonly used in many simulation programs. In the DYNATUNE 7-DOF model all instantaneous contact patch loads in X-Y-Z directions, caused by aerodynamic loads, traction/braking and lateral acceleration are calculated for the desired vehicle condition. 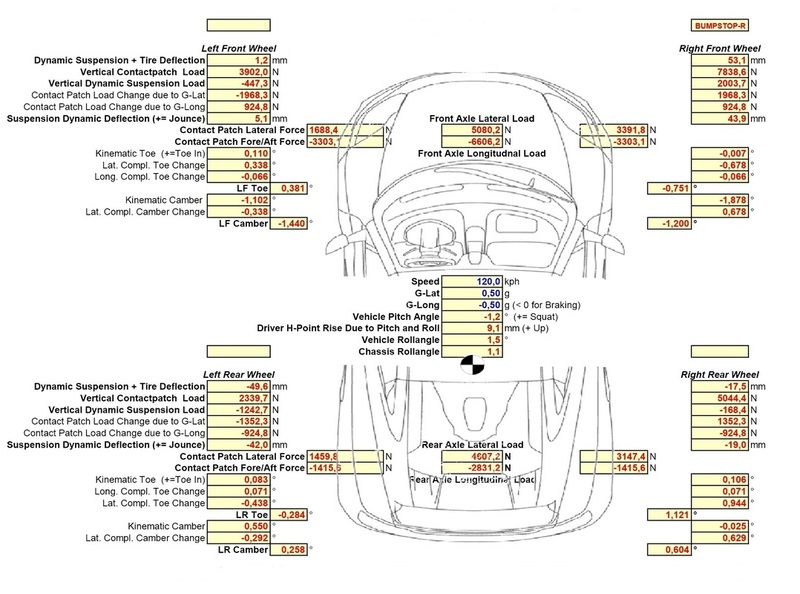 Based on these contact patch loads, data like wheel deflections, kinematic & elasto-kinematic wheel movements, ride-height changes and instantaneous center of gravity height are being calculated. All relevant parameters and calculation results from the 7-DOF Vehicle Model are being used - if necessary - for updating the boundary conditions of the linear bicycle model (like tire cornering stiffness) permitting in this particular way a partially non-linear approach to calculate non-linear understeer behavior of the vehicle with the bicycle model. NEW: In DYNATUNE 7.0 from "BASE"-Version onward, the optional "ENHANCED TIRE MODEL" is available. When activated, the "ENHANCED TIRE MODEL" will make the 7-DOF Vehicle Model the main simulation engine for all NON-LINEAR Calculations, including PERFORMANCE ENVELOPES and their corresponding use for LAPTIME SIMULATIONS. As can be seen in the 2 left graphs, the tire characteristics "Lateral Force" and "Aligning Moment" show the commonly well known non-linear behavior (quadratic/parabolic function) over slip angle. However, looking at their derivatives "Cornering Stiffness" and "Aligning Torque Stiffness" at the right, one can see that these parameters show almost linear behavior in the operating range (in fact, the derivative of a quadratic/parabolic function is a linear function). The DYNATUNE "BASE TIRE MODEL" assumes for these parameters (partially) linear behavior, making in this way a robust approach to high g-Levels possible. 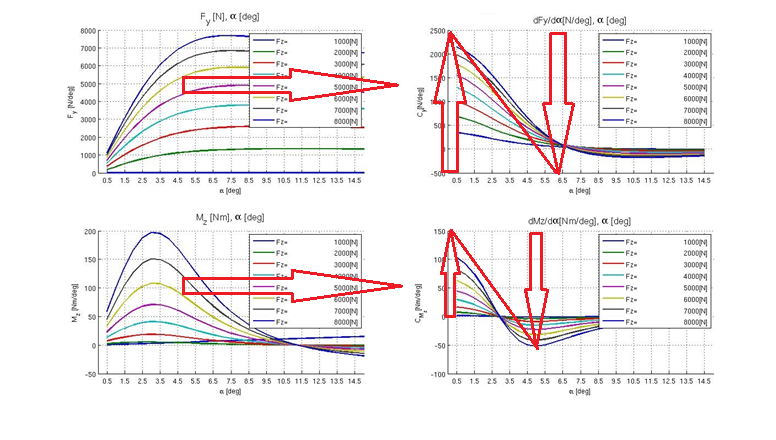 In effect, as shown by the red arrows in the 2 right graphs Cornering Stiffness (or Aligning Torque Stiffness) will increase with increasing vertical load (arrow-up) and decrease with increasing slip angle (=increasing lateral load) close to 0 at the maximum grip level (arrow-down). The operating range is identified with the diagonal line. 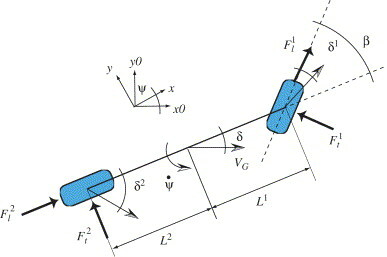 Following this ideology for each AXLE a resulting AXLE Cornering Stiffness will be calculated and based on the load transfer data from the 7-DOF Model for any given lateral G-Level the data to be used in the Bicycle Model will be updated with resulting in correct Front and Rear Axle Cornering Stiffness for that particular G-Level. The Front and Rear main Tire Parameters are defined at a Reference Load Condition which are to some extend scalable with a parameter that governs tire-sensitivity to vertical load changes. By using a Reference Load and a Load Sensitivity Parameter the DYNATUNE "BASE TIRE MODEL" can be easily adjusted to reflect correct tire behavior for any specific load condition of the vehicle. Combined Slip Conditions (Lateral and Longitudinal Tire Loads) are simulated according to the Friction Circle Equations for Tire Friction Coefficient µ. At "zero" Longitudinal Force, Tire Cornering Stiffness will be maximal and at full longitudinal µ saturation, Tire Cornering Stiffness will be minimal. Equally the lateral friction coefficient µ will be maximal at "zero" longitudinal load and minimal at maximum traction/braking force. NEW: In DYNATUNE 7.0 from "BASE" Version onwards is the "ENHANCED TIRE MODEL" available as an extension to the "BASE TIRE MODEL". The "ENHANCED TIRE MODEL" will transform the 6 parameters (Cornering & Aligning Torque Stiffness, Camber Thrust, Reference Load, Mue and Load Sensitivity Factor) from the "BASE TIRE MODEL" into a conventional NON-LINEAR TIRE MAP in which Lateral Tire Force is represented as a function of Tire Slip Angle and Tire Vertical Load. A specific TIRE DATA USER TOOL - as shown in the picture above - has been developed to visualize the Tire Data from the Enhanced Tire Model. With the "ENHANCED TIRE MODEL" all NON-LINEAR Calculations based on the 7-DOF Vehicle Model can be calculated correctly to the very highest lateral accelerations by balancing inside and outside tire slip angles more accurately with inside and outside tire lateral loads (a matter, which is approximated by the partially linearized axle cornering stiffness approach in the "BASE TIRE MODEL"). All other "LINEAR" Calculations/Procedures based on the Bicycle Model remain with the "BASE TIRE MODEL". - DYNATUNE DOES NOT USE TIRE RELAXATION-LENGTH PARAMETERS. The DYNATUNE Dynamic Linear Ride Model, which is being used for calculating Ride Step Input & Ride Frequency Response, exists basically out of two independent vertical half vehicle models with front and rear body, springs and (linearized) dampers. Front and rear unsprung masses are connected to both front and rear body by suspension spring and damper, as to ground via the tire vertical spring combined with a generic tire damping (which is derived from typical numbers for % critical tire damping). All equations are solved via Laplace Transformations. Generic calculations for natural bounce & pitch frequencies with/o bounce and pitch centers are classically calculated by solving the differential equations of a simplified reduced order model.